Despite the heavy rain and chilly winds, the Baby G felt cozy and inviting on Tuesday night. 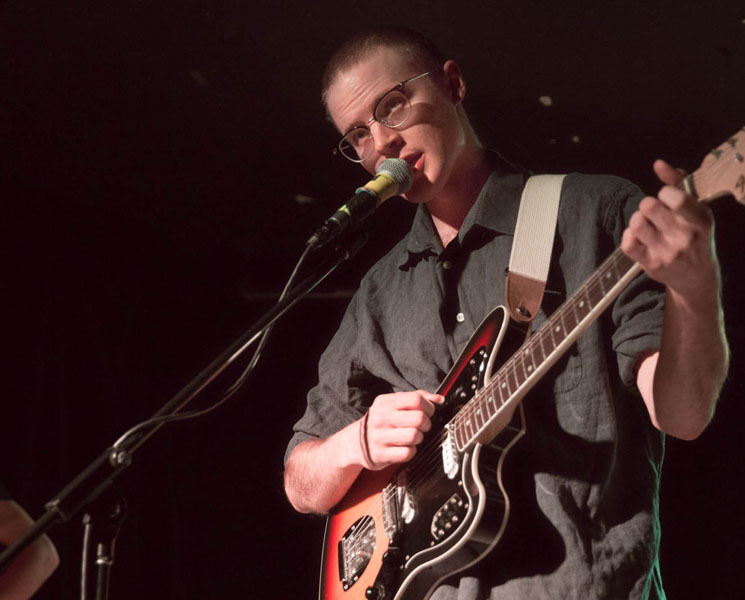 By the time Halifax favourites Nap Eyes hit the stage, the small performance space was comfortably packed and the show was confirmed as sold out before the doors even opened. It was the first date of their North American tour in support of their excellent third LP, I'm Bad Now, and they seemed well-prepared with a polished set. Though the bill only featured two bands, and the inclement weather likely delayed arrivals, Montreal-based duo She-Devils opened the show exactly on time. This turned out to be a shame as they delivered an entrancing showcase of entirely new material. Vocalist Audrey Ann had an open notebook with lyrics on it that she flipped through between songs, while Kyle Jukka warped and tweaked an eerie selection of samples. While the band's self-titled record has a summery, psych-pop vibe to it, almost reminiscent of early Panda Bear with its looped guitar lines and swirling effects, the newer songs had a decidedly darker tinge. It fit the atmosphere of the evening quite well, as Jukka's production focused on gloomy, monochromatic sounds and Ann's lyrics repeated lines like "I am the villain" and made reference to tears and fears being like "passing ships lonely in the night." Her commanding melodies slid through minor scales and gave shape to the nebulous instrumentals that felt more oriented towards affect and mood than the breezy jams of their prior work. It was a captivating 20 minutes or so, and many latecomers lamented only catching a couple of the five songs they debuted. Nap Eyes received a warm welcome to the stage and stoked anticipations by opening with the droney, Velvet Underground-esque "Judgment," off their new LP. The song builds around a one-note guitar line and anxious drum rattle and led nicely into single "Every Time the Feeling," which elicited appreciative whoops. The band sounded tighter than ever and seemed at home cruising through their recent material, which made up a bulk of the performance. "Stargazer," from 2016's Thought Rock Fish Scale, made a welcome appearance, as did a "very old" cut possibly from vocalist and songwriter Nigel Chapman's pre-Nap Eyes days. Chapman, for his part, has an endearing and easygoing stage presence. His deadpan delivery comes through loud and clear without any discernible effects or reverb, and he has no problem bending a vocal line away from its recorded melody or letting out a coy chuckle mid-song. The mix at the Baby G sounded perfectly balanced and gave just enough room to Brad Loughead's nuanced splashes of lead guitar. Drummer Seamus Dalton's kit was dampened with what appeared to be dish towels that gave the percussion an even, compressed sound and made the rhythm section feel especially locked in. After brushing off a request for "Thriller," they closed with "Dark Creedence," the opening track from their debut. It's a beautiful song that floats along over shimmering guitar arpeggios and a cycling bass line that often gets extended well past its four recorded minutes. Nap Eyes kept it relatively concise this time around, though. The brevity of the performance overall was its only shortcoming, as the band's first two records didn't see much representation in an already compact set list. As unfair as the demand would be, they could have played all night; the freezing rain on Dundas St. was showing little signs of abatement and no one seemed particularly eager to leave. ​She-Devils Reveal Debut Album, Share "Hey Boy"